Last summer we featured the Optical Booster from Gene Davis that magnifies the image viewed with Benchrest scopes. Since then, we’ve received dozens of questions about the product. Gene’s Boosters have proven very popular, and over the past year he’s brought out new models, including a slip-on version that fits most 1″ or 30mm scopes. You can now see all the offerings on Gene’s website, BulzEyePro.com. 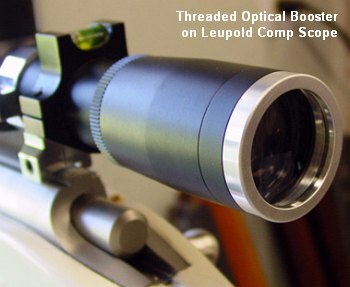 Gene now sells Screw-in Boosters for Leupold Comp Series scopes (made after 2003), March scopes, NightForce BR scopes, Sightron BR scopes, and Weaver T-Series scopes. These screw-in, threaded 3X boosters cost $100.00 including shipping and insurance. We think Gene’s invention is a winner–a great way to get more magnification at a low cost — $100.00. We also like the fact that, unlike an internal boosting job, you can simply remove the booster if you want to return to the original magnification level. Installing the Optical Booster #1 requires no modification to your scope. However, Gene explains: “You may need to screw in the scope’s eyepiece (ocular lens) a bit to maintain the sharpness of the cross-hairs”. 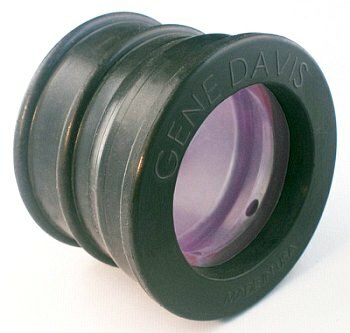 For greater versatility, Davis now offers a Slip-On Optical Booster #2 with a rubber housing that fits any scope with an eyepiece diameter of 1.45″-1.75″. This allows you to easily move the Booster from one scope to another. 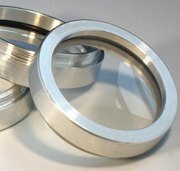 In addition, a variety of lenses can be inserted in the flexible rubber housing. You can switch from a 3X Lens to Gene’s latest lens, the 4X-Multicoat Extreme Long-Range 50-to-Infinity. 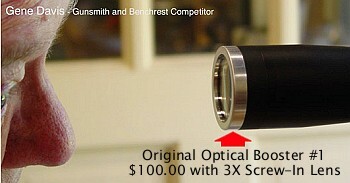 The Slip-On Booster Model #2 currently costs $95.00 with 3X lens or $125.00 with 4X Long-Range Multi-Coat lens. Gene reports: “The Optical Boosters do a fantastic job for old or poor eyes. We now have screw-in models to fit Leupold, March, Nightforce, Sightron, and Weaver Scopes. The Boosters require no internal modification and will not alter the factory warranty. 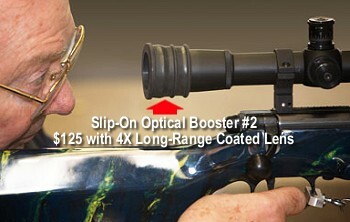 To purchase, contact Gene Davis at (740) 503-4486 or visit www.BulzEyePro.com. Share the post "Davis Optical Boosters–More Models, More Options"
Torx Head screws are superior to other fastener designs for attaching scope rings and bases. The patented Torx design can be tightened very firmly with much less chance of stripping. Torx-head screws are available in a variety of sizes and thread pitches to fit your particular rings and the scope base holes tapped in your receiver. Now through July 31, 2008, MidwayUSA is offering a complete kit of genuine Leupold Torx-head screws with 80 base screws and 70 ring screws for just $30.00. That’s 25% off the regular $39.99 price. Every gunsmith should have this kit, and regular shooters might want to purchase the kit as well. When you’re mounting a new scope base or ring set, it’s great to have exactly the right Torx screw you need. The Leupold Torx screw kit, MidwayUSA item 235284, contains a 50/50 mix of black and silver color screws so you can match them to both black- and silver-finish scopes. 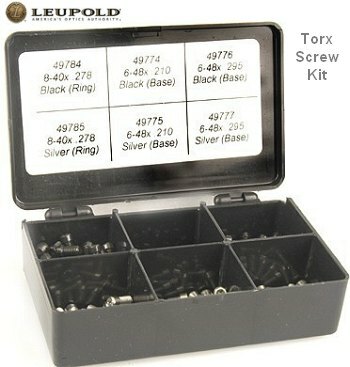 Share the post "Leupold Torx Screw Kit On Sale"